Thank you for checking out the newest dry cleaning concept in the industry. We will WOW you with our service, prices and quality. Please check out each one of the pages on this site, you find out just how special we are! 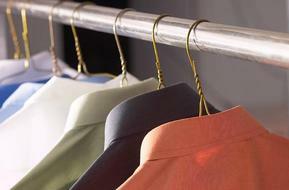 You may already have a dry cleaner…even a good one. But in Livingston, you can now have a GREAT one! The newest dry cleaner in the neighborhood is Dry Clean Spot. For just minimal fee, you can have almost any of your items dry cleaned and with our eco-friendly processes; we are good for both your wallet and the environment. The new store is located at 184 S. Livingston at the Cedar Mall Shopping Center (where CVS is an anchor). Walking in the door, low prices would not be your impression. The lobby is inviting with ceramic tile floors, wood trim, French doors and air conditioning. TV monitors can be viewed to keep you informed about the latest weather. The staff is well-trained, efficient, and friendly. Everyone who works for Dry Clean Spot appreciates the importance of excellent customer service as the cornerstone of the business. You can even join the VIP program to drop off cleaning and be out the door in seconds! Freshly cleaned clothes with sweet smell - best in the area!